I'm talking about the country of Georgia, of course, though I'm sure there are a few someones in the good state of my mother's birth making sweet fruit wine, but that's a whole different bag. The country Georgia is an independent state of the former Soviet Union situated between the High Caucasus Mountains and the Black sea (caviar!). Georgia is one of the oldest winemaking areas on the planet - archaeologists have discovered countless artifacts like jewelry and wall paintings depicting grape bunches and leaves, fountains of wine and the like, dating back to between 3,000 and 2,000 BC. Today, Georgia may still be behind in technology and market share, but from the remarks my wine expert friends post to Facebook these days, I can surmise the country is producing some good stuff. I went to a shrimp boil the other weekend and met some new friends who are into wine. We started talking wine - they had some questions and I had some answers - one of them remarked that he'd been in Georgia recently for work and had brought back several bottles. He had one left, insisted I taste it and zipped home to grab it. This was my first Georgian wine, and I have to say, I was pleasantly surprised. The winery is Khareba in the eastern region of Kakheti, and the grape variety is saperavi, an indigenous and common variety in Georgia and neighboring Central Asian countries and those formerly a part of the Soviet republics. 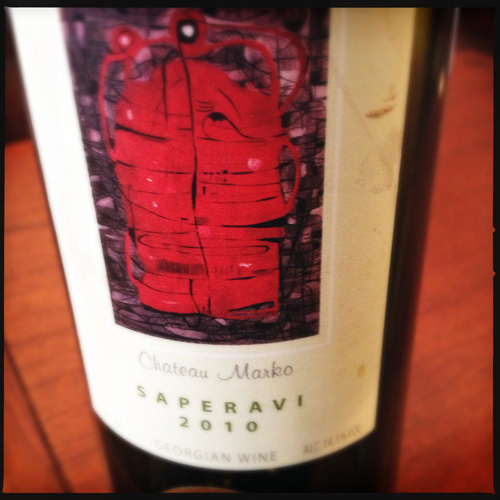 From my research, I've learned that saperavi is a dark skinned grape with pink flesh and potentially high acidity. According to Winery Khareba's website (take a look, though be warned the English translation is rough), the grapes are fermented in traditional earthenware jars buried in the ground and sealed with a mixture of clay and ashes. There are also photos of very modern stainless steel tanks on the same page, and my knowledge of winemaking tells me this wine was probably fermented in tank, then spent some time in French oak, of which there are also photos on the website, and if I remember correctly, hints of such in the wine. Perhaps the wine was then stored in jars - it is a 2010 - or maybe the jars are for show and part of a history lesson. As I said, the English translation is rough. I can say with confidence that the wine exhibited green bell pepper notes, reminding me of cabernet sauvignon. The tannins were a bit chewy, though not so dry I couldn't sip without chasing it with food. The structure was impressive, acidity apparent and well-integrated. I'd say it's a meat favoring wine with some flexibility in food pairing. The back label, most of which is in Georgian, reads: "Saperavi is rich with dark pomegranate color. Food matching: vegetables, chill collations and dressed meat." Not sure what "chill collations" are but I like the sound of it. Unfortunately, I don't think we have any Georgian wines for sale in Alabama, but it's so rare that I get to try something so uncommon, I wanted to share it here. I'm glad I got to try it and am honored to have been included in the experience. It was the perfect accompaniment for the requisite meeting-new-people-in-Florence inquisition. "Where do you go to church?" (asked in jest) "Where do you live?" (said in half jest) and "Auburn or Alabama?" (asked with complete sincerity, and as usual, when the response is I don't really watch football, a silence suggesting we no longer have anything to talk about swallows the moment). A toast to new friends and new wine; as they say in Georgian, გაგიმარჯოთ!